Commander of the National Guard of the Kingdom of Bahrain Lieutenant-General Sheikh Mohammed bin Isa bin Salman Al Khalifa paid a courtesy call on Prime Minister Imran Khan on Tuesday and discussed issues of mutual interest, including the regional situation. The prime minister said Pakistan values its fraternal ties with Bahrain and has an abiding interest in further augmenting these ties in all spheres. He also expressed satisfaction on the existing level of bilateral cooperation, particularly in the field of defence. Lt Gen Al Khalifa extended invitation on behalf of the prime minister of the Kingdom of Bahrain Prince Khalifa bin Salman bin Hamad Al Khalifa to the prime minister of Pakistan to visit Bahrain. The prime minister accepted the invitation and reciprocated by extending invitation to the prime minister of Bahrain to visit Pakistan. 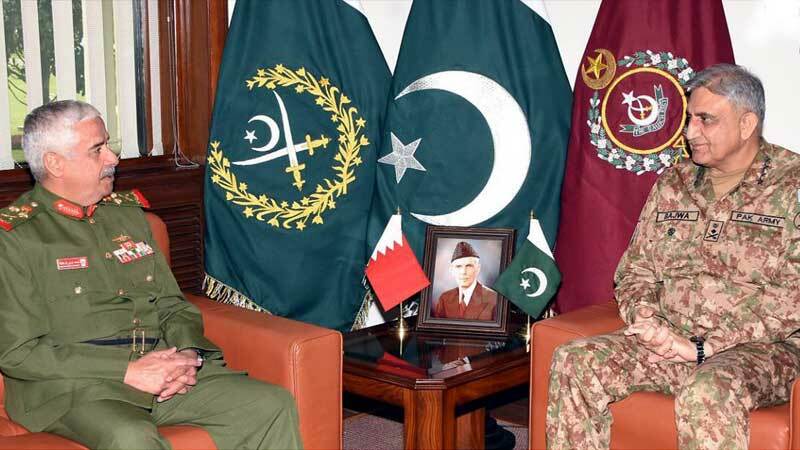 Separately, Lt Gen Al-Khalifa called on Chief of Army Staff (COAS) General Qamar Javed Bajwa. According to a press release issued by the Inter-Services Public Relations (ISPR), during the meeting held at the General Headquarters (GHQ), matters of mutual interest and overall regional security situation came under discussion. Both sides agreed to further enhance military cooperation, the ISPR said. The visiting dignitary also appreciated Pakistan’s positive role for regional peace and stability, the ISPR added.